AI for solar materials; stopping facial recognition; lithium-manganese cathodes. In the search for better organic photovoltaic materials, researchers at Osaka University turned to machine learning to help identify candidates. While organic photovoltaics (OPVs) are promising on a cost basis, they do not yet have the required power conversion efficiency (PCE) necessary for commercialization. A key element in this is the semiconducting polymer layer. The team gathered data on 1,200 OPVs from around 500 studies. Using Random Forest machine learning, they built a model combining the band gap, molecular weight, and chemical structure of these previous OPVs, together with their PCE, to predict the efficiency of potential new devices. Random Forest uncovered an improved correlation between the properties of the materials and their actual performance in OPVs. 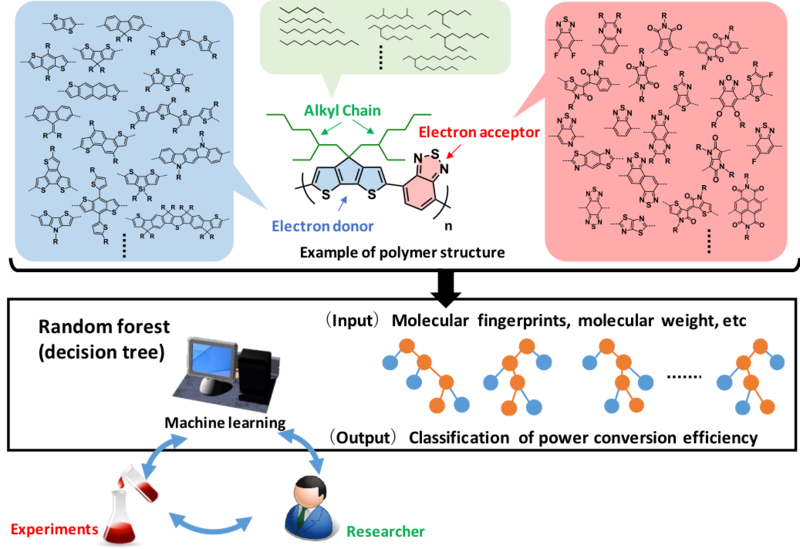 To exploit this, the model was used to automatically “screen” prospective polymers for their theoretical PCE. The list of top candidates was then whittled down based on chemical intuition about what can be synthesized in practice. This strategy led the team to create a new, previously untested polymer. In the event, a practical OPV based on this first try proved less efficient than expected. However, the model provided useful insights into the structure-property relationship. Its predictions could be improved by including more data, such as the polymers’ solubility in water, or the regularity of their backbone. Researchers at the University of Toronto are pitting two neural networks against each other to come up with a way to disrupt facial recognition systems. 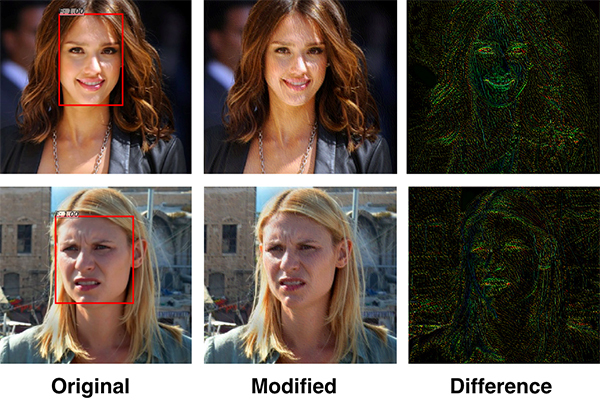 Using adversarial training, the first network works to identify faces, while the second tries to disrupt the facial recognition task of the first. The result, the researchers say, is a “privacy filter” that can be applied to photos that alters very specific pixels in the image. The team tested their system on the 300-W face dataset, an industry standard pool of more than 600 faces that includes a wide range of ethnicities, lighting conditions and environments. They showed that their system could reduce the proportion of faces that were originally detectable from nearly 100% down to 0.5%. “The key here was to train the two neural networks against each other — with one creating an increasingly robust facial detection system, and the other creating an ever stronger tool to disable facial detection,” said Bose. In addition to disabling facial recognition, the researchers say the technology can disrupts image-based search, feature identification, emotion and ethnicity estimation, and all other face-based attributes that could be extracted automatically. The team hopes to make the privacy filter publicly available, either via an app or a website. Researchers at Northwestern University propose two materials that could be used to stabilize lithium-manganese-oxide cathodes for future high-capacity batteries. A French research team first reported the large-capacity lithium-manganese-oxide compound in 2016. By replacing the traditional cobalt with less expensive manganese, the team developed a cheaper electrode with more than double the capacity. But it was not without its challenges. The battery’s performance degraded so significantly within the first two cycles that researchers did not consider it commercially viable. They also did not fully understand the chemical origin of the large capacity or the degradation. To find out why the cathode was having such challenges, and the underlying reason for the cathode’s high capacity, the Northwestern team composed a detailed, atom-by-atom picture of the cathode. They found that it forces oxygen to participate in the reaction process. By using oxygen — in addition to the transition metal — to store and release electrical energy, the battery has a higher capacity to store and use more lithium. To stabilize the battery, the team began looking for suitable materials that could stop the rapid degradation. “Armed with the knowledge of the charging process, we used high-throughput computations to scan through the periodic table to find new ways to alloy this compound with other elements that could enhance the battery’s performance,” said Zhenpeng Yao, a former Ph.D. student at Northwestern. The computations pinpointed two elements: chromium and vanadium. 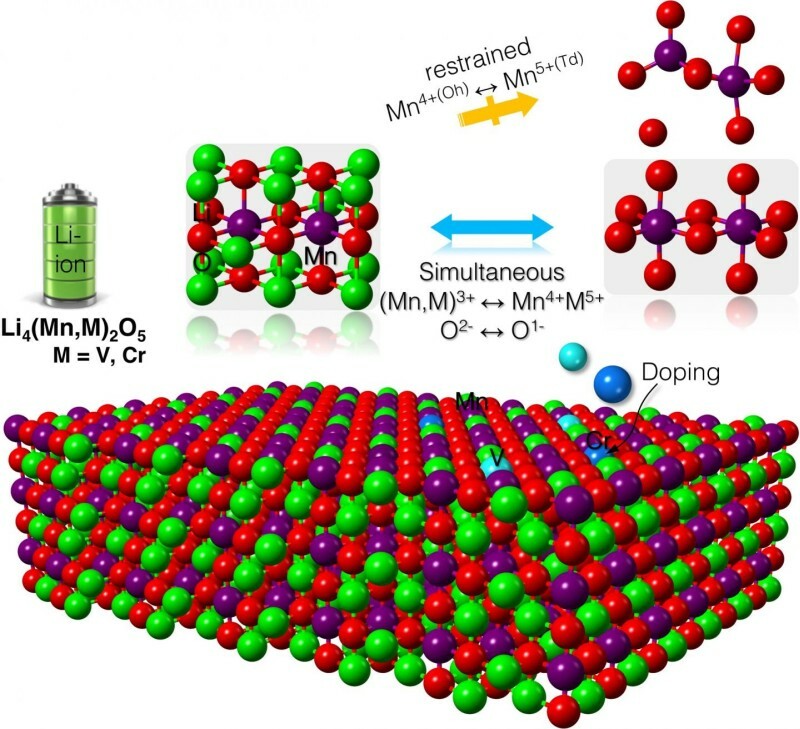 The team predicts that mixing either element with lithium-manganese-oxide will produce stable compounds that maintain the cathode’s high capacity. The team plans to move forward in experimentally testing these theoretical compounds.